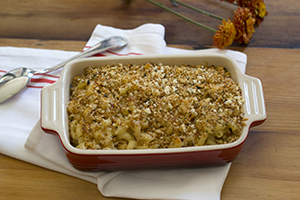 For all the moms-to-be in the house, we know you need gooey, golden comfort for two, which is why we tailored our Classic Mac and Cheese recipe just for you, swapping out raw milk cheeses for equally meltable and delicious pasteurized varieties. Expectant mom, Daphne Oz, approves! Pre-heat your oven to 350 degrees. Grate all cheeses and combine. Cut a slit into the halved onion and place a bay leaf in the slit. Stick the 2 cloves into the onion. Start making the mornay sauce by placing the milk in a saucepan over medium low heat and adding the onion. In a separate saucepan, melt the butter and add ½ clove grated garlic. Slowly add the flour, whisking to combine, and cook for 2 minutes. Ladle in the warm milk, whisking constantly, until combined and smooth. Add the nutmeg, black pepper and cayenne pepper. Add 5oz Irish Cheddar and 5oz Taleggio and 3oz Fontina and 3oz Isabella Gouda. 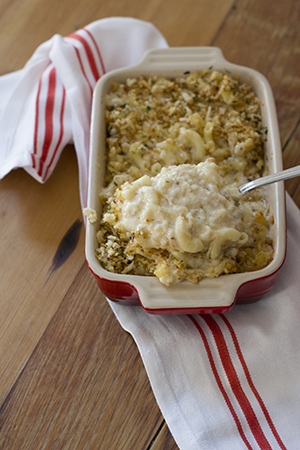 Pour the mornay sauce over the macaroni and toss to combine. In a small sauté pan, melt 3TBS butter and add the panko breadcrumbs, thyme and lemon zest. Place the combined macaroni and cheese into a shallow baking dish and top with the grated Cabot and the breadcrumbs. Bake in a 350-degree oven for 20 minutes and serve. Bon appetit! As seen on The Chew.